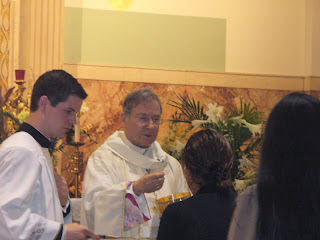 To have Mass offered for the Holy Souls is certainly the most efficacious way of relieving them. 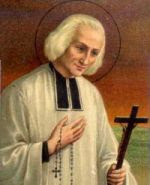 "Since it is certain by the doctrine of the Catholic Church, that the souls detained in purgatory are benefited by the prayers of the faithful, and especially by the august Sacrifice of the Altar, we think we can give them no more useful and desirable pledge of our love than by everywhere increasing the offering of the pure oblation of the Most Holy Sacrifice of Our Divine Mediator, for the extinction of their pain." Hence Father Suarez declares that it is now the sentiment of the universal Church, that 'the intercession of Mary is not only useful, but even necessary to obtain graces.'" This declaration is based on Sacred Scripture according to St. Bernard. 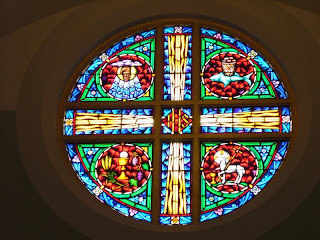 Hence it is not without reason that the Holy Church wills that we should all call her our common hope, by saluting her, saying, 'Hail, our hope!'" St. Bernard called Mary the "the whole ground of our hope." 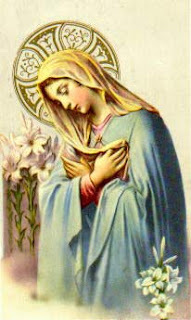 He said "seek for graces" and "seek them through Mary". St. Antoninus taught that if we ask for graces without her intercession, we shall be making an effort to fly without wings, and we shall obtain nothing. He wrote: "He who asks without her as his guide, attempts to fly without wings." St. Alphonsus writes of a Father Auriemma's book Affetti Scambievoli where the good Father wrote of innumerable favors granted by the Mother of God to those who practiced the devotion of visiting her often in her churches or before her image. The Blessed Mother of God would grant many graces, especially in the gift of understanding to those who visited her regularly such as St. Albert the Great, Abbot Rupert, the aforementioned Fr. Suarez. They became renowned throughout the Church for their great learning. 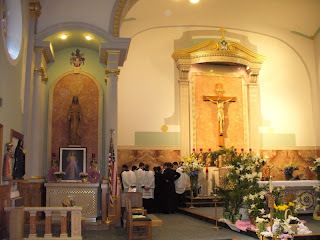 She also granted graces to St. John Berchmans who visited our Lady daily in the chapel of the Roman college. He declared that he renounced all earthy love, to love no other after God than the Most Blessed Virgin and had written at the foot of the image of his beloved lady "I will never rest until I shall have obtained a tender love for my Mother". St. Bernadine of Sienna visited our lady, in his youth and declared that Our Lady had ravished his heart. He referred to her as his beloved and visited her often. She in turn obtained for him the graces necessary to renounce the world. "Do you then, be also careful always to join to your daily visit to the Most Blessed Sacrament a visit to the most holy Virgin Mary in some church, or at least before a devout image of her in your own house. 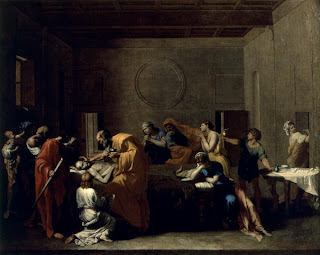 If you do this with tender affection and confidence, you may hope to receive great things from this most gracious Lady, who, as St. Andrew of Crete says, always bestows great gits on those who offer her event he least act of homage." Who can e'er forget thee? By thy mercy, by thy love. Have pity, Queen on me? St. Louis de Montfort stresses that among these four means devotion to Mary is the surest, the easiest and the quickest way to the perfect development of the Christ-life in us. New Movie - The Stoning of Soraya M.
There is a new movie opening up this June, 2000 from the producers or The Passion of the Christ and starring Jim Caviezel. It is based on the international best-selling book by French-Iranian journalist Freidoune Sahebjam. This film is based on a true story. Stranded in a remote Iranian village, Sahebjam is approached by Zahra, a woman with a harrowing tale to tell about her niece, Soraya, and the bloody circumstances of her death just two weeks before. Her story exposes the dark power of mob rule, uncivil law, and the lack of rights for women. Her last and only hope for justice lies in the hands of the journalist who must escape with the story - and his life - in order to communicate the violence to the world. From the depths of my misery, I adore Thee and I give Thee thanks. and the only goal of my earthly pilgrimage. I may be able to fix my gaze upon the blessed splendors of Thy glory. partake of the Sacred Feast. "Almighty God and Father we beg you through the intercession and help of the archangels Michael, Raphael, and Gabriel for the deliverance of our brothers and sisters who are enslaved by the evil one. All saints of Heaven, come to our aid. From anxiety, sadness and obsessions, we implore Thee, deliver us O Lord. From hatred, fornication, envy, we implore Thee, deliver us O Lord. From thoughts of jealousy, rage and death, we implore Thee, deliver us O Lord. From every thought of suicide or abortion, we implore Thee, deliver us O Lord. From every form of sinful sexuality, we implore Thee, deliver us O Lord. 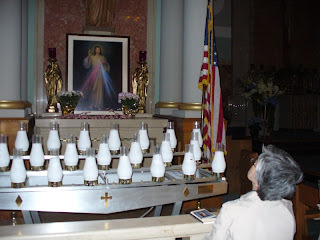 From every division in our family, and every harmful friendship, we implore Thee, deliver us O Lord. From every sort of spell, malefice, witchcraft, and every form of the occult, we implore Thee, deliver us O Lord. Thou who said "Peace I leave you, my peace I give unto you." Grant that, through the intercession of the Virgin Mary, we may be liberated from every demonic influence and enjoy Thy peace always. In the name of Christ, Our Lord. Amen." 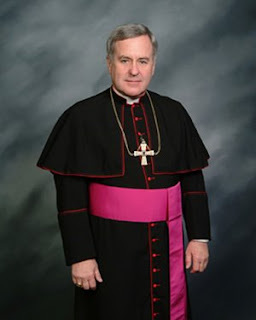 There is news on all over the Catholic blogosphere about this new appointment. This past Divine Mercy Sunday, Bishop Arthur Serratelli of the Diocese of Paterson, celebrated the rededication Mass of Blessed Sacrament Church in Paterson, New Jersey. This is the church that I remember as a little girl of 4 or 5. The huge edifice and marble interior used to intimidate me. Actually, I used to be afraid to go into the Church. This was supposed to be our parish church. We were parishioners there during my early youth. 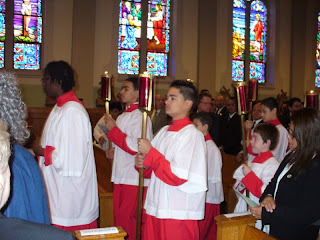 Then we attended Our Lady of Victories Church for a few years. 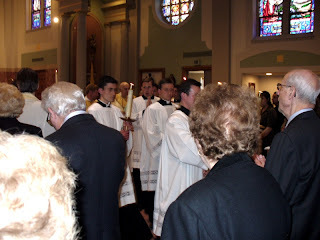 When we were enrolled at St. John's Cathedral school, (I was in 8th grade then), we attended Mass at the beautiful Cathedral in downtown Paterson. In our early adult years, nearby Our Lady of Lourdes Church became our church home. Now over 20 years later, my mother, sister and her husband are back home at Blessed Sacrament Church. 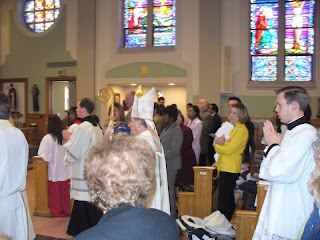 This rededication Mass was very beautiful and fitting for a glorious Divine Mercy Sunday. It was standing room only. My brother in law who was an usher that day said there were over 100 people standing in the back. There were many invited guests too. 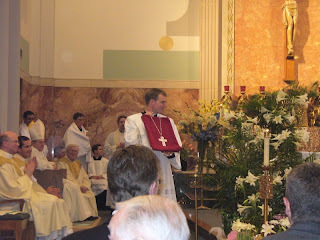 A few notables were past pastors like Fr. 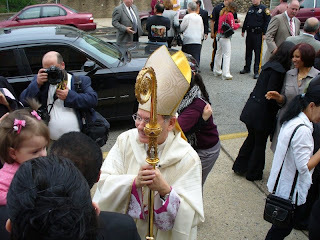 Trapasso, Monsignor Vincent Puma, former bishop of Paterson, Frank Rodimer, Father Eugene Palumbo, the Legionaries of Christ priests, brothers and seminarians, civic leaders, the Sheriff of Passaic County, etc. We felt privileged to be among the many faithful that day. 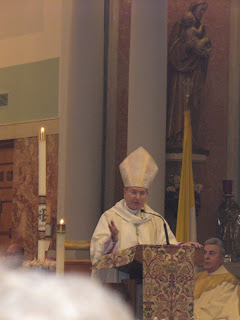 The day before was Bishop Serratelli's birthday. 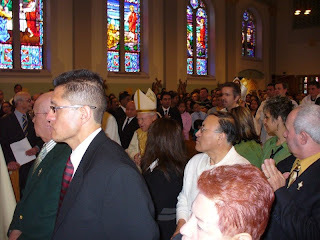 We all sang Happy Birthday to him at Father Patrick's prompting. Credit for this successful and very special occasion has to go to the pastor Fr. Patrick Ryan. He really did a spectacular job in ensuring that everything went well. 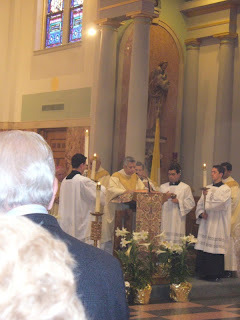 Here are some photos from the Mass. 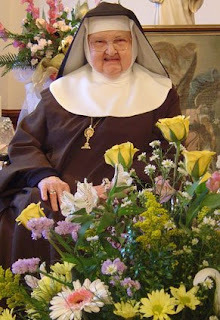 A very happy and blessed birthday to dear Mother Angelica of the Eternal Word Television Network. Thanks to Heather, the Catholic Mom in Sweden for the reminder! 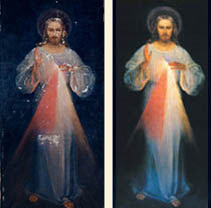 This is the Divine Mercy image at Blessed Sacrament Church. 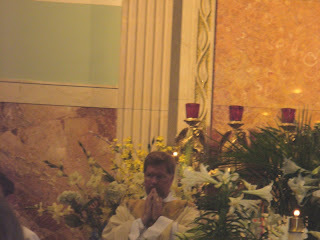 I caught my mom praying prior to Mass. Happy Divine Mercy Sunday Everyone! Before and after photos of the Vilnius Image after the restoration process in 2003 by the Archbishop of Vilnius, Lithuania. I will save those cities and houses in which this Image will be found. 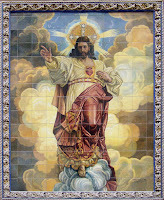 He also said: I will likewise protect the persons who will honor and trust in My Mercy." Angelina traveled to Krakow, Poland then on to Lagiewniki Sanctuary of Divine Mercy where she met with the Congregation of Sister's of Our Lady of Mercy. Angelina's favorite place to have visited, Lagiewniki is filled with love and peace. A person can meditate and pray as they walk the grounds of this enormous area. The Basilica is truly magnificant with the tabernacle in the shape of the world.